We hope you enjoyed the Behind the Scenes video by Summerfield Films in our last blog post. Today, we’re going to begin to tell how Wendy’s vision for this Canadiana wedding style shoot story all began. Thank you Rhythm Photography for these gorgeous images. Since Canadian history included a lot of logging and other forestry related products – we showcased the talented crew at www.FerrisWheelPress.com. All their products are designed and handcrafted in Toronto, Canada. 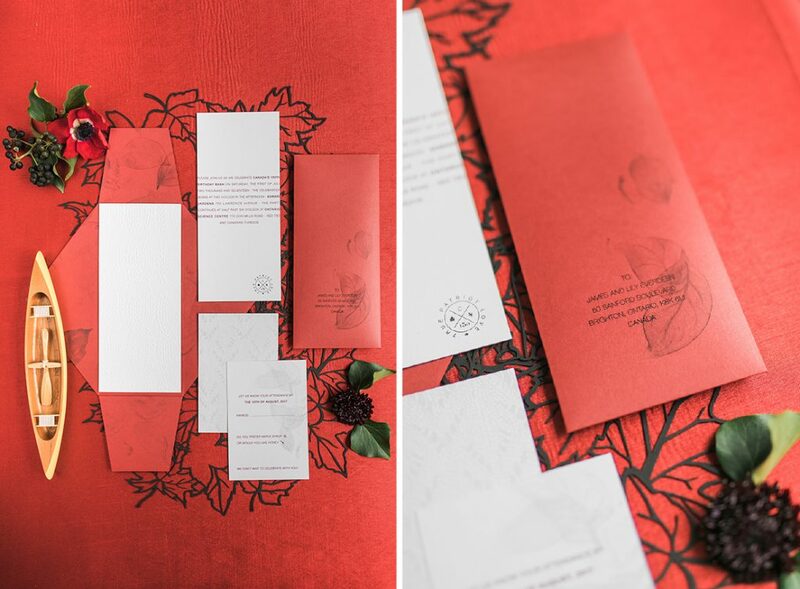 For our shoot, Ferris Wheel Press designed the wedding invitation, menu cards, table number as well as a canoe with some wonderful Canadian sediments. 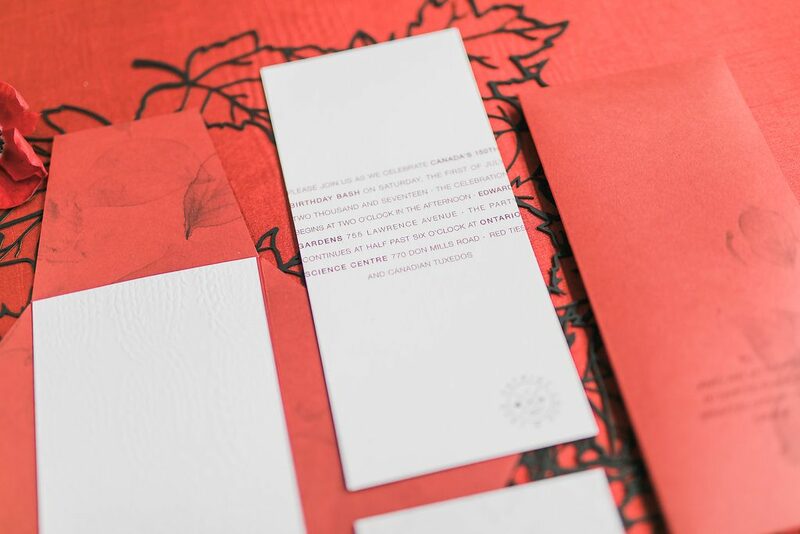 The subtle background pattern added visual texture to the stationery suite. The various shades of red really emphasized the red of our Canadian flag. The interplay between the red and black was inspired by the lumber jack plaid. We absolutely love the laser cut out black maple leave collage in the background – an iconic symbol to all Canadians symbolism our #CanadianPride. We just adore how the little silver fish even had a slit in the mouth to keep the table number upright. Wendy was thrilled to be able to use the plaid plates; which fit into the overall mood of the table top design from her personal collection. The clear plates from Event Rental Group actually featured a leaf pattern with all the intricate veins that a real leaf would exhibit. The wood cut charger plates and other table top rentals were also from Event Rental Group. Although we couldn’t show case a live moose, a pewter key chain wedding favour displaying a Canada Moose was the next best thing as a nod to Canada’s wildlife. Wendy is a Toronto WEDDING PLANNER whose specialty is “East marries West” weddings in the Rocky Mountains, Greater Toronto Area, New York area, Vancouver area, Los Angeles area, Southern California and in the beautiful destination of Bali, Indonesia. Whether you need wedding planning assistance, a fully designed event or wedding day coordination, Wendy can help you design your most memorable wedding day. CONTACT HER today, she’d love to hear from you. We, Canadians are celebrating the 150th anniversary of Confederation and February 15 is National Flag of Canada Day. This is not only a powerfully symbol, it is a tremendously meaningful one in our Canadian identity. Canadian history may not be as long as other nations, but it is still certainly rich with much to celebrate. So, with that in mind, Wendy was inspired by our National Milestone and created a wedding design concept to showcase our Canadian heritage. Many of the wedding decor items represents the array of natural resources that Canada has to offer. You’ll find that the team created a wedding story that showcases a bit of a rustic vibe; which speaks to the history of our lumber industry. Therefore, the natural colour palette chosen reflects that of the lumber jack red and black plaid. You’ll also find silver tone elements that represent Canada’s mining industries. Thank you to Anita Cheung of Rhythm Photography and John Summerfields of Summerfields Films for the fabulous showcase of images and all the behind the scenes footage. Here’s a sneak peak of the Behind the Scenes…..Catch up with Us on Monday as we start to share more Canadian Pride. We’re so thrilled to have Kirsten and Mark’s story featured in the Global News today. Here’s the story…. 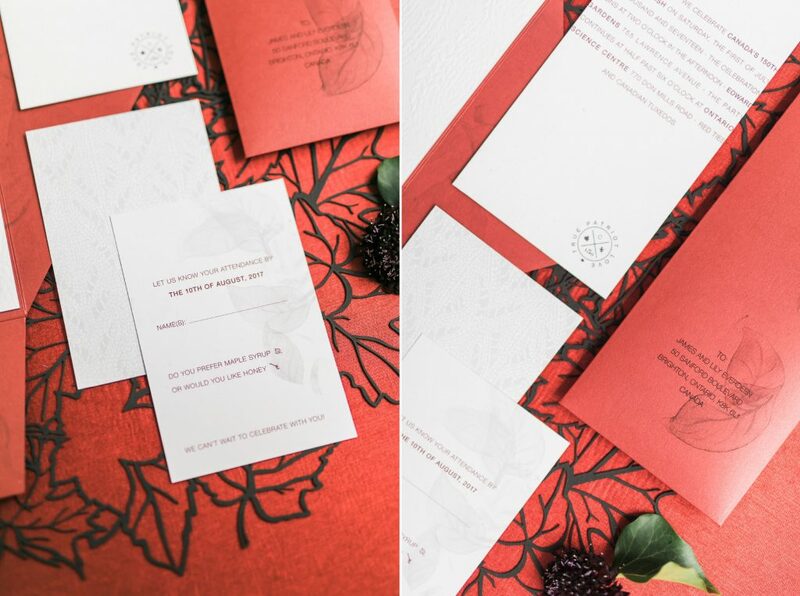 Our original budget was around $65,000, but we talked to our Asian Fusion Weddings – wedding planner and with our parents — it was a collection of understanding what our vision was for the wedding combined with talking to our parents who were gracious enough to help us with the funds. Our parents obviously helped but we’ve saved over the past few years and we had funds available that weren’t wedding-specific, just general savings. We were probably more frugal than we’d been before. Our wedding planner helped us stretch our budget and delivered us some savings — we cut $10,000 off the wedding price when we moved our date to May from October 2017, which was a major thing. Wendy is a Toronto WEDDING PLANNER whose specialty is “East marries West” weddings in the Rocky Mountains, Greater Toronto Area, New York area, Vancouver area, Los Angeles area, Southern California, San Francisco area and in the beautiful destination of Bali, Indonesia. Wedding season is right around the corner and many brides have already started to pick out their bridesmaids for their bridal party. If you have ever been in a bridal party before – you know what the true financial impact it can have on your very own pocket book. For those of you who are new to this arena, we thought we would highlight a few things so you can be ready when your invitation to be bridesmaids occurs. Bridesmaid’s dress, suit and/or attire – The basic reality is, that most dresses that the bride chooses for her bridal party – bridesmaids will never be able to wear again. Shoes – Hopefully the bride won’t pick mustard yellow, or some other colour you will never be able to wear again. Accessories – the bride will let you know if she wants necklace, bracelet and/or earrings. Hair stylist – no more fly away, unruly styles. You will get all dolled up by the professional. Make-up artist – no need to worry about the jitters with make-up application because the professional is going to make you picture perfect. Perfectly polished nails; both hands and feet (especially if you are wearing sandals without hose). Bachelorette party and/or bridal showers – Some brides end up having multiple parties and showers. Therefore, it is best to be clear if there are financial contributions required for each event on behalf of each bridesmaid. Destination Wedding – who is going to cover the cost of flight, accommodations and food for the bridesmaid that needs to travel to get to the wedding. Dress and shoes – you’ll likely have to go for various appointments to try on dresses and shoes with the other bridesmaids. Then once they are ordered, you’ll have fitting appointments to attend. Planning events – as a bridesmaid, you will likely need to help organize and plan events such as shower(s) and bachelorette(s). How much time this equates to will depend on the number of events and the complexity of the events. If the plan is to do more of a DIY event, then you’ll need to factor in time for shopping, making and assembling items, set-up and take down. Hands on help – the bride may need help with invitation assembly, tying favor tags, writing out place cards, assembling ceremony programs, etc. Again, how many hours, will really depend on the complexity or intricacy of the components. When you have a mixed cultural wedding, lines of finances can even be blurred further. For Chinese wedding customs, the bride and groom pay for all the bridal party’s attire, shoes, accessories, hair stylist, make-up artist and nails. However, the bride and groom do not purchase a gift for the bridal party members. This would be the exact reverse for Western wedding cultures. The bridal party would pay for all those items, and then the bride and groom would purchase a gift. Essentially the dollar figure spent is exactly the same, but the funds are coming out of a different wallet. If you are in the predicament where you have been asked to be a bridesmaids, but simply cannot afford to either pay for all the attire and activities – and/or you are not able to contribute the amount of time that is needed to help the bride, then be honest with yourself and the bride. Being best friends with the bride means that she will understand that you need to pay rent and make student loan payments. Being best friends of a gracious bride means that she will thank you for being upfront and honest. It’s best to stay as friends for life, rather than have no friendship at all after the wedding. If you’ve got any bridesmaids concerns or questions, don’t hesitate to give us a ring at 416-918-3891 or drop us a line at services@asianfusionweddings.com. Chinese Wedding Planner Behind the Scenes – What’s it really like to be on TV? Last month I had the privilege of being on OMNI Focus Cantonese to speak about decorating your home for Chinese New Year with Carmen from Devoted to You. It’s a program that is taped in the Breakfast Television and CityLine studio in downtown Toronto and broadcast in south western Ontario. I had only ever been on camera once for an interview several years ago for CTV about the shark fin soup ban in Toronto. Here are some tips to keep in mind when you are on camera. Many thanks to Pepper and Light for taking photos during the taping. a) Ease of speech and share your expertise – In many ways, this experience was completely different than being on CTV. For starters, it was all in Chinese. Gulp! Yep, Chinese is not my native language since I was born in Canada. However, my Chinese is conversational enough that my bride’s and groom’s parents are really surprised that I was actually born in Canada. Needless to say, there was some homework on my part before going on camera. I needed to know what are the Chinese words for certain things like charger plate. Funny enough, there isn’t a direct translation for charger plate in Chinese!! Therefore, I could describe its function – a decorative plate where one places another plate on top. My take away is to be prepared. I was given the questions ahead of time by the TV anchor and generally scripted all the answers for Carmen and I. Essentially, you want to come across as being the polished expert and not have trouble expressing your words due to nerves. Therefore, rehearsing it before hand will also help you remember what you are planning to say even under pressure. b) Sharing the spotlight – Remember, the host of the program is there to help keep the momentum of the interview running smoothly and might even want to run things through with you right before taping; as in our case. Therefore, there is no need to talk over the host. He is there to share his spotlight with you. Be extra polite because you are on someone’s else home turf. You never know, if they like you – you might even get invited back for more interviews. If you are part of a team, you will want to ensure that each member gets even coverage if possible. Therefore, discussing it before hand what areas of focus each member will address would be very helpful. Sometimes things just can’t be evenly divided 50/50 and that’s ok. There’s room for everyone to receive recognition. c) Be camera ready and look the part – since we knew what our topic entailed, we decided to dress the part as well. It’s important to know how the camera reacts to patterns such as stripes, plaid, check, etc. Therefore wear attire that is professional in appearance. Initially we were told that we were going to be sitting on stools. Therefore short skirts were not something that we were planning to wear. We didn’t want to feel too self-conscious about ensuring that our legs be crossed in a certain way. We wanted to feel completely as ease while on camera. Hair and make-up is a must for the camera. My gorgeous look was created by Nicole Richard’s team. I completely had faith that Nicole’s team would transform me. They are the experts at what they do, so I simply told them that I was going to be on TV and they got to work. I had complete trust that they would make me camera ready. It’s no surprise, but even our handsome host had some on! d) Props and other items for display – since our TV interview was about decorating at home, we set up two place settings with coordinating linens that could be filmed. We also provide photographs and video for OMNI in case they wanted to splice some extra things into the program. Since we knew ahead of time how much time we would be given to set up, we brought what would be manageable in that time frame. We were also informed about parking and loading in/loading out procedures that made it easy for us and for the TV crew. When the table was completely set up, the camera crew then tested our microphones and looked through the cameras. They told us where to stand, and then immediately told me how far I could move left and right because of the height of our menu card and the size of the floral arrangement. So if you watched the interview on TV, you’ll now understand what I didn’t move much at all. e) Last but not the least, take a deep breath and enjoy the ride – this segment is only about 10 minutes long. Time really ticks away quickly. It actually took longer to set up than the interview itself. My best advice is to just be yourself and act natural. Don’t chew gum on camera. Don’t get distracted by the lights and camera. Just simply focus on what the host is asking and give your answers accordingly. Since the interviewed aired, both my Chinese speaking friends and non-Asian friends have watched the segment. I’ve watched the interview a couple of times just so that I can think about ways of improving things the next time around. It was also pretty neat to surprise my dad in particular; since he watches OMNI Focus religiously. It was definitely fun and loved every minute of it! !